The Blickman Utility Cart is versatile enough for any application requiring transport, including mail, patient records or laboratory materials. 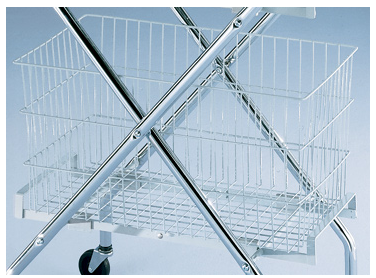 Choose any combination of 6" (2441) or 12" (2442), poly-coated wire baskets to complete your cart. The metal frame is designed for easy folding storage. Rubber stoppers support and protect the poly-coated wire baskets. The three-inch, hard rubber casters provide for a quiet ride.